Today we are looking at the StarTech SATSASBAY425 which is a 4-in-1 2.5″ drives to 5.25″ drive bay hot swap unit great for SSDs. 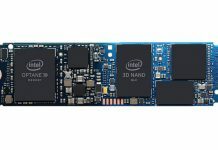 As SSD prices fall, it becomes more likely that users will turn to RAID 0, RAID 1 or RAID 10 arrays to provide extra speed, redundancy and/ or capacity. 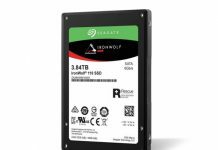 Personally, I have had at least three SSDs in my main workstation for two years now. 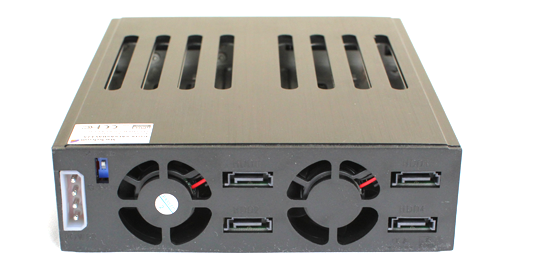 Recently Thermaltake sent its 4-in-1 solution, the Thermaltake MAX-1542 hotswap enclosure that puts four 2.5″ hot swap drive bays into a single 5.25″ drive slot. Long time readersof this site may remember I used similar 4-in-1 devices with my old 8x 15K rpm SAS setup. At that point I used two Athena Power 4-in-1 hotswap enclosures but came away thinking that they were not the best in terms of noise, especially cooling 15,000 rpm 2.5″ SAS drives. Let’s see how the Startech SATSASBAY425 compares to the other units. Traditionally 5.25″ bays were a common hard drive form factor until about the days of the Quantum Bigfoot in the mid-1990’s. Since then the 5.25″ bays have been normally reserved for full size optical drives. 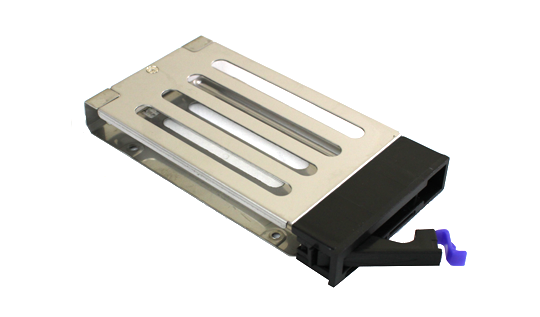 With hot swap drive enclosures, these 5.25″ bays can be re-purposed to accommodate either 3.5″ or 2.5″ drives. 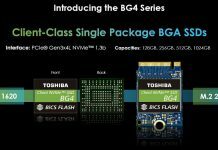 Using 4-in-1 and 6-in-1 enclosures, a user can get much higher drive densities out of traditional server and tower enclosures when using 2.5″ drives. The StarTech SATSASBAY425 itself looks really sleek with a black enclosure accented by a little bit of blue on its plastic door levers. Once can see a very stylish front area and that there are clear channels for airflow along both the top and bottom portions of each drive. This gets some substantial airflow moving through the chassis. As one can see, the rear of the enclosure is optimized for airflow. The PCBs that distribute power and route the SATA connections are clearly visible in the rear of the enclosure and the connector shows it accepts both SAS and SATA disks. Hot-swap drive bays make it easy to swap disks out. One can simply push the blue latch, swing out the handle and pull out the drive. This makes replacing a drive in the event of a RAID failure very simple. The drive tray seen here is very similar to the Thermaltake MAX-1542 except for two important differences. First, the top portion is made of metal. Second the StarTech version screws securely in place while the Thermaltake version uses a plastic locking mechanism. Since neither allow for tool-less drive insertion, the StarTech version is probably more secure which is a good thing. The rear of the chassis shows four 7-pin SAS/ SATA connectors. From most motherboards this is a very simple 7-pin to 7-pin connector. If you are using a RAID controller or HBA such as an IBM M1015, you would use a SFF-8087 to 7-pin break out cable to connect this enclosure to the RAID controller. Common misconceptions are that most of these hot swap / RAID controllers provide RAID functionality or special enclosures are needed to run drives in RAID. This is not the case since these days most hot swap / RAID controllers are made to pass-through disks providing only housing, a data channel, cooling and power. StarTech also utilizes a standard 4-pin Molex connector which makes it compatible with most power supplies. 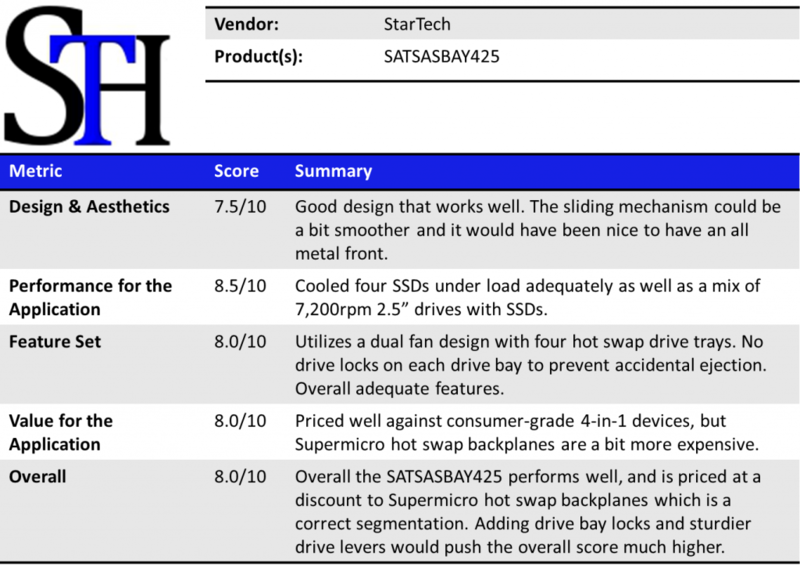 Overall, for those looking at a consumer 4-in-1 for solid state drives, the StarTech SATSASBAY425 is a solid choice. It is fairly quiet which is much better than those units intended mainly for 15K RPM drives and servers. For those users that want hot-swap SSD trays and have limited space, this is an excellent option as it does easily expand an enclosure and allows for rapid drive slots. I again tried nine different drives in the enclosure and all fit without issue. I did like the fact that StarTech opted for less plastic and less metal and that they did address the highly eye-popping red color of the Thermaltake units by moving to a small bit of blue accents. Just looking at the all black Carbide 500R chassis the small blue latches look interesting but not overpowering. Two of these can be used with an inexpensive controller such as the IBM M1015 or other LSI SAS 2008 controller to get a nice eight drive 6.0gbps subsystem. I would love to see one of these in a tool-free version one day which would make replacing SSDs in RAID arrays trivial. The SuperMicro 4 in 1 2.5in is really not that much more expensive and it is superior in every way. I bought one a few weeks back. Adding the screw to the top bracket gives the sleds more rigidity and have no issues sliding. Maybe this is a newer version since I had an older unit that have the sliding issues. Where I live the supermicro is mas expensive. I was looking for a 4 bay 2,5″ bay last year and had a look on the startech as well. I found out these are produced and sold under a variety of labels. Construction and used materials (2 4×4 fans) looked a bit weak and airflow seems ineffeicient for high performance 10k / 15k sas drives to me. So I went for the Raidsonic (http://www.raidsonic.de/en/products/backplanes.php?we_objectID=6804). Pig — no fan failures out of ten of these I have in norco servers. Is your power supply good? Got one after reading this. Will you review the SATSAS225ODD or SATSAS425BK looks like they have locks? What abt the USB 3.0 docks?